It’s time to talk about salad – a really big salad. Not bird-like or dainty or a few pieces of lettuces. 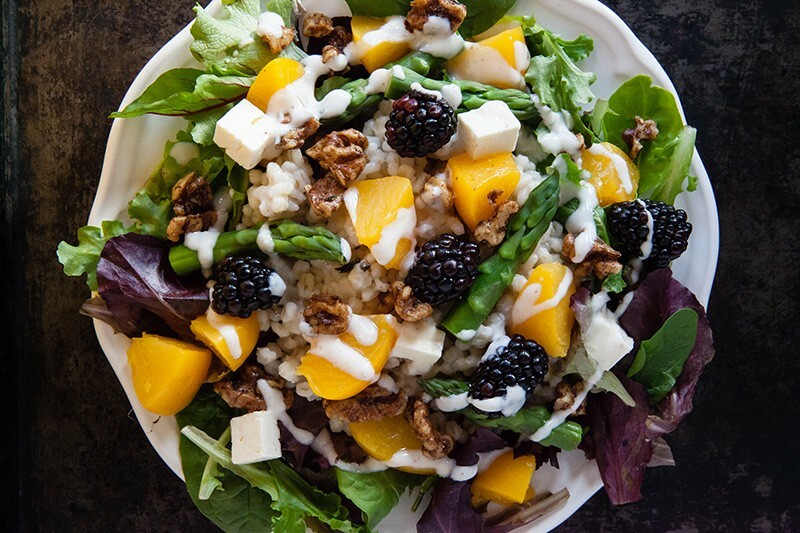 No – we’re talking about a hearty salad full of barley and spicy toasted walnuts with feta and blackberries, vivid crisp asparagus and bright, juicy peaches. 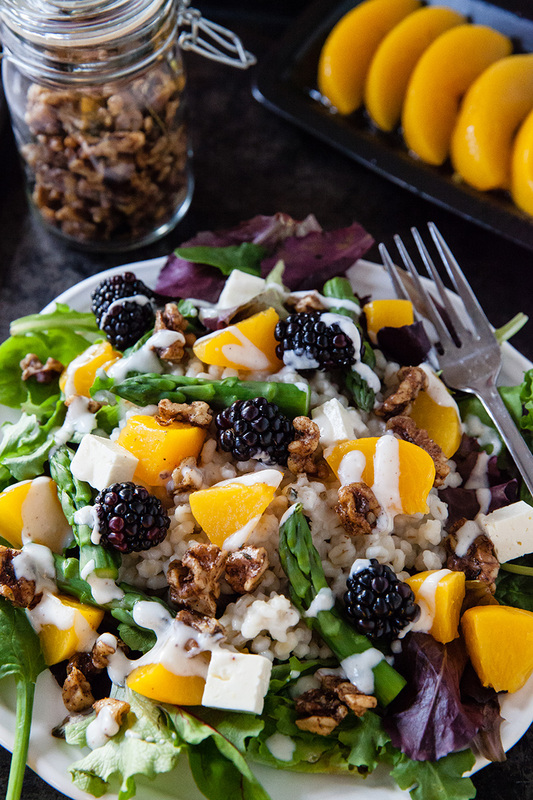 A peach barley salad that is worthy of being called a meal! It’s been a while since I’ve posted a new recipe but I’ve actually been in the kitchen a lot during January! Unfortunately, most of it has been client work for FBC and not for me and the blog. Well, not unfortunately – it’s great to be busy with so much client work! Most of it I can’t talk about yet but, there is one project that I got wrapped up that I really enjoyed – and it was creating this big salad. If you just want the recipe you can pop over to Food Bloggers of Canada right now. If you’ve stuck around to see what else I have to say, I want to talk about barley. I personally think barley is soooooo underrated. It’s one of my favourite grains and you can use it at breakfast, lunch and dinner. I know most of us think about it as a soup filler instead of noodles but you can do so much more with it. You only need a little bit because it’s very filling – I find it just as filling as eating lentils – which always have me full very quickly! I also really enjoy the slightly chewy texture of barley. frying it with spices and veggies for dinner. It’s been a lot of barley – such is recipe development! This also used one of my favourite winter ingredients – canned peaches. I’ve loved canned peaches since I was a little kid – my mom kept our pantry stocked both with home canned peaches from the Okanagan and canned peaches from the grocery store and they were always one of my favourite desserts with a scoop of vanilla ice cream. Canned peaches add such a burst of flavour and colour to any dish in dreary January – and you can use the juice they’re packed in to make a great peach dressing. The one I came up with included yogurt and chili! 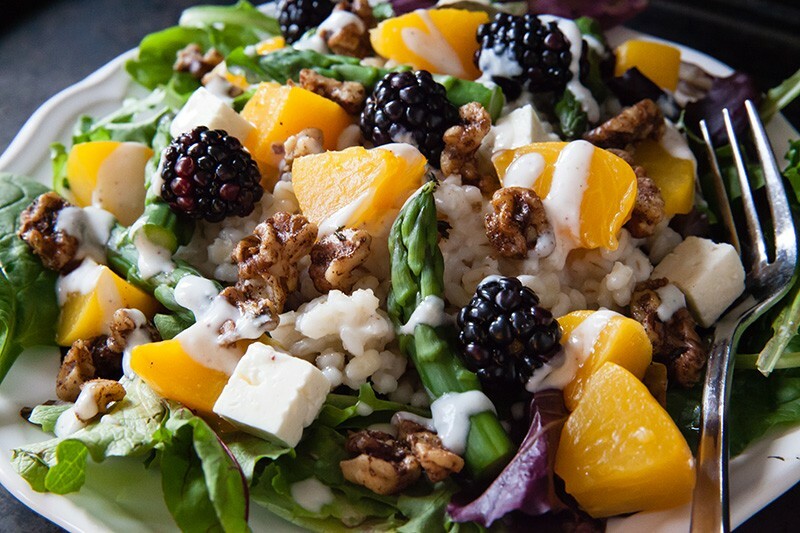 This is one of the best salads I’ve created in a while and I loved the contrast of sweet from the peaches and berries, the saltiness from the feta and the spicy notes from the toasted walnuts. So good! You can head on over to Food Bloggers of Canada to get the whole recipe and I hope you enjoy it!